This is from a not so recent trip down south with Neal and Kirk, its Meelup Beach and its a really nice spot in the world. While we were shooting this there were Humpback Whales just cruising by very slowly and quite close as well. It was almost inviting enough to swim if it wasn’t so cold and 5am in the morning. I need a really long lens and a boat to be able to get out there and photography some of those whales! I can’t wait to get back down there again to shoot away again. 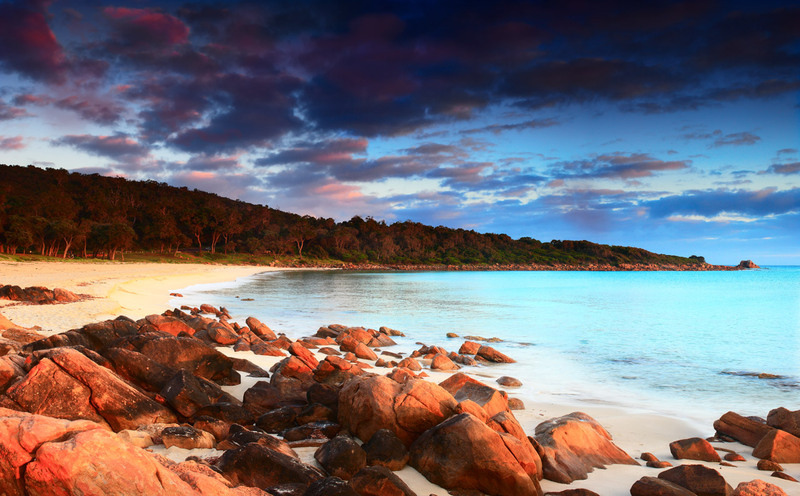 This entry was posted in Australian Landscapes, Beach Photos and tagged australia, beach, blue, dunsborough, Jamie Paterson, landscape, meelup beach, panoramic, seascape, southwest, sunrise, water, western australia. Very nice Jamie, that was one gorgeous morning the water was an amazing blue colour. I can’t wait to get back down there as well. Those beaches are stunning. Neal firstly, thanks for the great comment always appreciated from a professional like yourself. I was trying to convince Melissa that we should duck down this weekend but apparently Xavier has his first birthday party to go to. So that ends that. This looks like an awesome spot Jamie ! the water is divine – no wonder you want to head back there as soon as you can. mate you guys might have to pay a tax if you keep getting good shots from my backyard! I can ride to Meelup in about 15 mins from my house! Thanks for that. Its a wicked spot. Great for a picnic in summer. I’d be surprised if you didn’t see more photos of this beach from Neal in the next couple of weeks. Your gettin better in a hurry mate! But i do think you reds might be a little strong in this image! But tone them down a bit and this isw a ripper! Thanks for that, I’ll take onboard the advice. Much appreciated. you’ve already summed it up in the title Jamie. Thanks for that. My shot doesn’t do justice to how beautiful the water was that morning.